This year, the Spokane Brewers Festival is heading indoors, hosting all the beer, food and music on the Spokane Arena floor. Take advantage of the fantastic brewing going on throughout the Inland Northwest at the annual Spokane Brewers Festival, held this year on Aug. 4 on the floor of the Spokane Arena. 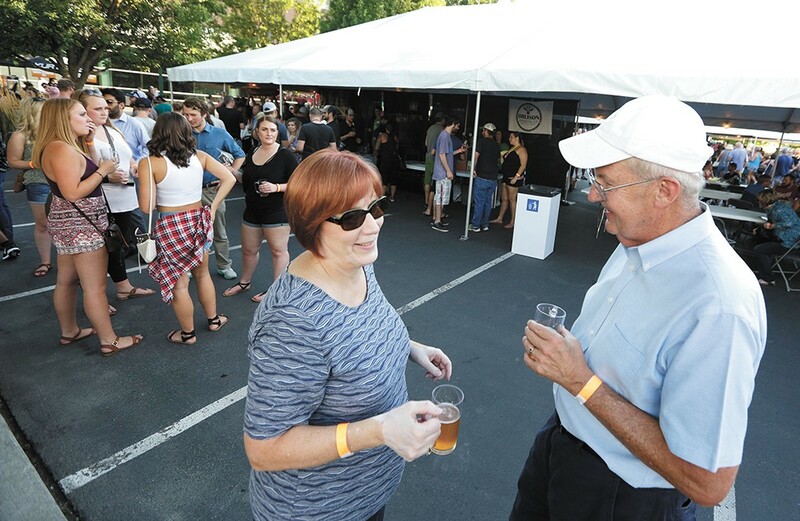 The festival boasts participation by brewers throughout Eastern Washington and Idaho, as well as food options and live music, all with the focus on drinking local. The extravaganza will host local microbreweries like River City and Young Buck as well as the big boys like Lagunitas. Cider fans can be assured that they will have plenty of options from Tieton, Summit and more. Tickets are $25 presale and $30 at the door. To purchase visit ticketswest.com, the Spokane Arena Box Office or call 800-325-SEAT. The folks at Barrister Winery in Spokane and the local YWCA are putting on another benefit night on July 13. "An Evening in Tuscany" is a chance to enjoy an extravagant Italian dinner with some of the best wine out there in an effort to raise funding for YWCA Spokane's domestic violence shelter for women and children. The meal will be accompanied by art, music, an auction and dessert. Tickets are $85 and available at ywcaspokane.org. As I accumulate more summers in the dry Spokane heat, the more I need to diversify the adult beverages to quench said heat. As wonderful as the craft brewing in the Northwest is, nothing sounds as unappealing as the bitter aftertaste of a swilled IPA. So this summer, I'm hoping to make as many batches of the refreshing and limitless Spanish punch as possible. The beauty of sangria is that it can be enjoyed alone or with company. Hosting a backyard party or barbeque? Blow away your guests with a tasty wine punch that looks far more intensive than it actually is. The basic sangria recipe calls for a traditional bold Spanish red wine, a brandy or rum, some orange juice, sugar and whatever fruit you'd like to have help enhance the punch. After you mix all of the ingredients in, just refrigerate the punch for a couple of hours and enjoy. It's up to your discretion how far you'd like to modify the basic recipe. Perhaps add some seltzer or club soda to make it especially crisp and to cut some of the sweetness. Maybe use a white wine instead of a red to make a dryer taste. Making the drink your own is half the fun, as if you're reliving your college spodie days, sans the extra sugary mixers and alcoholic gluttony. Stir after each ingredient is added and let the final mix sit for an hour before serving. Enjoy some great food with your drink at Nectar Wine and Catering's Wine Wednesdays. Starting July 11 and through Aug. 22, aspiring sommeliers will be able to enjoy a three-course themed meal with a wine pairing for each plating. A ticket to each Wednesday night meal is $25. For more information including the theme of each date, visit nectarcateringandevents.com. Pub crawls are a great way to reminisce with your tribe and inevitably add a couple new members by the end of the night. Spokane Pub Crawls is turning that reminiscing into a bit of nostalgia as July 14 is '90s vs. '80s Pub Crawl night. Dress in the vintage gear of your decade of choice and Cabbage Patch or Cha Cha Slide the night away. Prizes will be awarded for best costume and participation includes a T-shirt. Register for $20 at spokanepubcrawls.com. Vintage Spokane not only boasts participation by 60 wineries, but also plenty of food and dessert from restaurants throughout the Spokane area. The largest food and wine event this summer, Vintage Spokane highlights the who's-who of Washington wine. The tasting event features award-winning releases as well as up-and-coming vineyards. The July 29 event is being hosted at the Davenport Grand Hotel Ballroom and features general admission ($55) and VIP ($75) ticket packages. A VIP ticket allows for an extra hour of tasting access. Find out more at vintagespokane.com. Join the Idaho Wine Commission on Lake Coeur d'Alene as they take their Savor Idaho North event on a sunset cruise from the docks of the Coeur d'Alene Resort. The sunset trip is accompanied by the live music of Douglas Cameron and samplings from award-winning vineyards throughout North Idaho. The $50 ticket to the event comes with wine tastings, a light appetizer and a commemorative wine glass. Tickets are available at brownpapertickets.com. 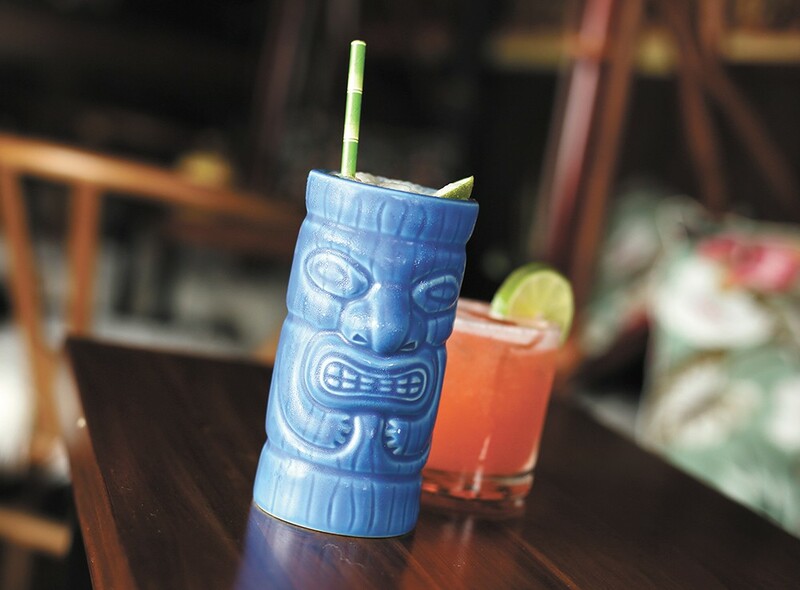 Get a taste of the islands at the newly opened Tiny Tiki in Spokane. MIGHT I SUGGEST A MAI TAI? Now that I'm living in this daily routine of closing the blinds and windows in hopes that my apartment isn't an oven when I get home, I know that I'll be out trying to find the best way to stay cool. To get in the proper headspace, I'm sure I'll wander down to the newly opened Tiny Tiki at 307 W. Second in Spokane. Their ice-cold mai tai mix comes from a smooth nitro tap that, coupled with the Polynesian decor, guarantees for a smooth teleportation to the islands. As great and necessary as a traditional margarita can be, maybe let this summer be the time you give a gin margarita a chance. The perfect pairing of lime with gin should shock absolutely no one who's sucked down a G&T or two, but the floral gin notes make a superb matching with the citrus flavor brought on by a triple sec, Grand Marnier or Cointreau. Add a little bit of soda water to turn this refreshing cocktail into the pre-Prohibition favorite "Gin Daisy." On Aug. 18 and 19, Maryhill Winery celebrates the release of its latest batch of bottles. The Maryhill Spokane tasting room is the only local spot to pick up most of these rare releases and the event offers a great opportunity for wine lovers to learn what separates this winery from the rest. The event is free to attend and a great way to receive special exclusive offers and consider a release membership. Warmer nights mean longer nights and longer nights mean rougher mornings when you go out Saturday. Bloody Marys have long been man's best friend when he's needed the hair of the dog, and the brand-new downtown Spokane bar Berserk, at 125 S. Stevens, has a Sunday Bloody Mary bar that would be a great way to recuperate. Patrons will be able to make their own Bloody Mary concoction with plenty of veggie options and ways to spice it up. The "Rising Sun" offers a change of pace with a hint of wasabi. The bar opens Sundays at noon. The original print version of this article was headlined "Drink | Summer Guide 2018"